Home online deals Krispy Kreme Coffee K-Cup Deal! Look what we found for you on Amazon! 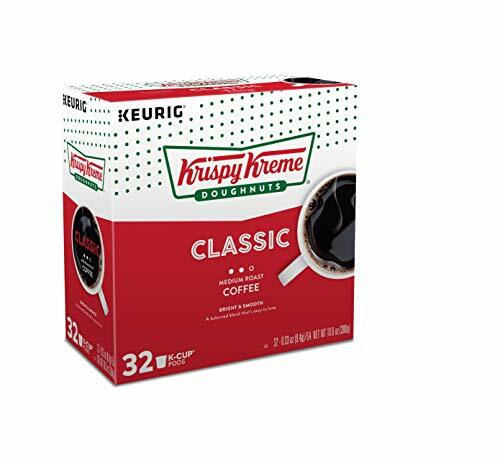 Hurry and get the Krispy Kreme Smooth Keurig Single-Serve Light Roast Coffee K-Cup Pods, 32 Count today for only $9.99 from Amazon when you choose a 1-time purchase! That’s just 30¢ per K-Cup (way less than my 40¢ or less stock-up price)! See how to get them for less than 27¢ per K-Cup with subscribe & save below! These Krispy Kreme K-Cups ship as an “add-on item”! Get FREE shipping (2-day for Amazon Prime members) when you purchase $25 or more of eligible items across any product category. Simply purchase 3 to get free shipping (since it will be more than $25)! Want to save even more? Choose subscribe & save on Amazon and have at least 5 subscriptions in a single month and pay just $8.49 (15% savings)! That’s less than 27¢ per K-Cup! There is no commitment with Subscribe & Save. You can cancel at any time! Plus, get free shipping!! Details here! A balanced, easy-to-love blend that boasts bright fruit notes and a clean, sweet finish. Buy the Krispy Kreme Smooth Keurig Single-Serve Light Roast Coffee K-Cup Pods, 32 Count from Amazon.